In April of 2009, I reviewed Ernie Halter’s album, “Starting Over.” As soon as I popped in “Live” and the groove that Halter seems to create effortlessly filled the room, a smile crept across my face and sitting still once again became a challenge. Recording a live album is no simple task. It exposes the artist and makes him or her extremely vulnerable. [A perfect example was shown tonight with Jason Derulo’s performance on ABC’s Dancing With the Stars. I couldn’t stop listening. Not because it was good. Think more along the lines of cars slowing down on the highway to stare at a car wreck. The people in the cars know it isn’t good, but they can’t…look…away.] With the way most popular music is today, not many artists can even consider recording a live album. Imagine Taylor Swift sans editing. Ok, stop. I don’t want anyone to start crying. “Live” laughs in the faces of computerized music and over-edited artists. Why? Because Halter doesn’t need all of those fancy tools to make himself sound good. He already is. When an artist is this honest with an audience, a new level of admiration emerges. Take the song Love in LA for example. On this track, Halter sings about giving up on love because he didn’t find love in LA. Weird, I know. I thought California girls were unforgettable, Daisy Dukes bikinis on top, too. Halter plays to the emotions that real people experience, which makes his music resonate with anyone who understands that he or she isn’t invincible. Love in LA is followed by my absolute favorite song on the album. Lighthouse was also my favorite from “Starting Over.” The sincerity heard in Halter’s voice is enough to convince listeners that he is singing directly to them. Halter’s convincing lyrics and tone to his voice make listening to “Live” a personal experience. Isn’t that what music is supposed to do? “Live” also features faster-paced tracks. Yes I Am stands as one of the best songs on the album, hands down. Halter seems to channel the swank of Stevie Wonder and the smoothness of Elliot Yamin to create a classic and timeless sound. Back up singers echo the main parts of the chorus and Halter peppers the song with flawless vocal runs. An amazing piano solo takes center stage towards the middle of the song. The pianists fingers tap dance across the keys, hitting them at a ridiculously fast pace at times, but also including the smoothness that the entire song seems to possess. Halter also finds a way to drive Better with the same swagger found in Yes I Am. He flips between full voice and falsetto seamlessly even includes a bit of the gospel song, Wade in the Water. While the inclusion may be simple, it makes the song. Music like this reminds me that extremely talented musicians do, in fact, still roam the Earth. 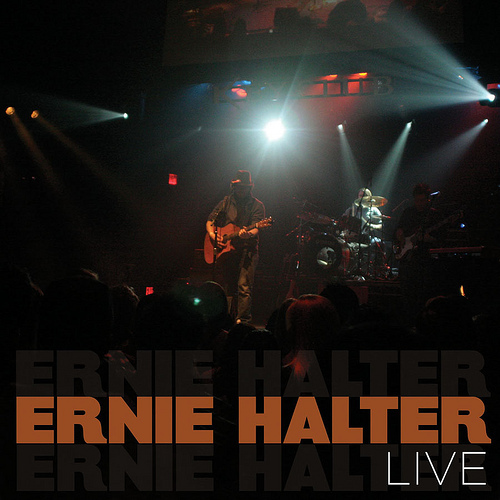 Halter’s ability to record a live album stands testament to his musicality [Interesting note: His last album “Starting Over” was recorded without any voice editing or pitch correcting. Speechless.] and the resounding truth behind his words make him a truly talented songwriter and performer. Tags: ABC, Better, Dancing with the Stars, Elliot Yamin, Ernie Halter, Ernie Halter Live, Gospel, Groove, Jason Derulo, Lighthouse, Live Music, Love in LA, Music, Pop, Rock Ridge Music, Soul, Starting Over, Stevie Wonder, Taylor Swift, Wade in the Water, Yes I Am. Bookmark the permalink. Previous post ← Almost to one billion views!